UPDATED (Dec. 3, 2015, 5:37 p.m.): North Carolina Democratic state Rep. Tricia Cotham has announced she won’t be seeking re-election to her House seat in 2016. Cotham, who’s served five terms in the legislature, made the announcement on Thursday. Her move opens up the potential for an openly LGBT lawmaker, something the state’s been missing since 2014, with openly gay Plaza Midwood businessman Billy Maddalon filing to run for the office on Thursday afternoon. Cotham cited her desire to spend more time with her family. Her oldest son, she said, begins school next year. LGBT advocates in the state were quick to praise Cotham for her LGBT-friendly leadership. As a lawmaker, Cotham was a staunch opponent of the state’s anti-LGBT marriage amendment and supported several LGBT-inclusive measures, including the School Violence Prevention Act, which codified sexual orientation and gender identity into statewide anti-bullying laws. Cotham also supported efforts to end anti-LGBT discrimination against teachers and state employees, as well as expanded comprehensive sexual health education. 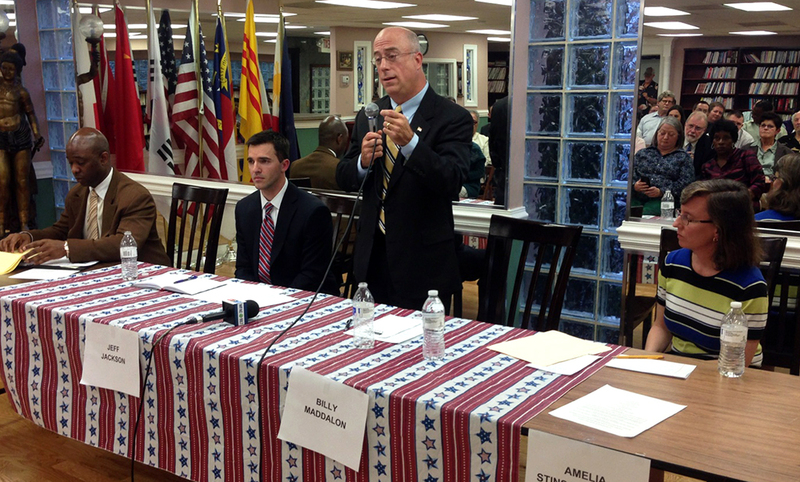 Billy Maddalon (standing) speaks at an April 2014 forum with three other candidates vying for a vacant state Senate seat (L-R): Darrell Bonaparte, Jeff Jackson and Amelia Stinson-Wesley. Photo by Matt Comer. Cotham’s decision not to run again in 2016 means her Charlotte seat will be open for grabs. Cotham’s district represents portions of the city long known for the LGBT friendliness and high proportion of LGBT residents. It could be a safe win for an LGBT candidate. Plaza Midwood businessman Billy Maddalon, who is openly gay, filed to run for the seat on Thursday afternoon. Earlier Thursday, Maddalon had said he was considering the run. For the LGBT community, too, Maddalon understands the significance of a potential run. If Maddalon wins, it would mean the election of the legislature’s first LGBT lawmaker since 2014. In that year, the state’s only out lawmaker, state Rep. Marcus Brandon, decided not to seek re-election. In 2011, state Sen. Julia Boseman stepped down. After the 2014 election, North Carolina was left without openly LGBT representation in the state legislature for the first time in a decade. Maddalon is owner of Plaza Midwood’s VanLandingham Estate, a one-time Charlotte City Councilmember and a recent Council candidate. He lost this year’s municipal primary by a slim margin and had at one time sought to fill the vacant seat left open with Dan Clodfelter left the state Senate to become mayor of Charlotte. Chris Sgro, executive director of Equality North Carolina, the statewide LGBT advocacy and education group, said Thursday that Maddalon’s or another LGBT candidate’s chances of winning are good, “especially in Charlotte,” Sgro said. Other potential candidates named by supporters and friends on social media Thursday include Charlotte City Councilmember John Autry and Sam Spencer, a longtime Democratic party activist and one-time North Carolina Young Democrats president.